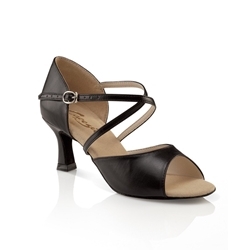 The Adult 2” Heel Latin Ballroom Dance Shoe – Capezio® SD01 comes in black and is available in Adult Sizes 5M – 11M. This lovely Ballroom Dance Shoe features an open toe and sides, and sports adjustable crisscross ankle straps to find that perfect fit. The cushioned insole and suede sole provide comfort for every dance, and the 2” Flared heel makes a bold statement every time you step up to the dance floor.